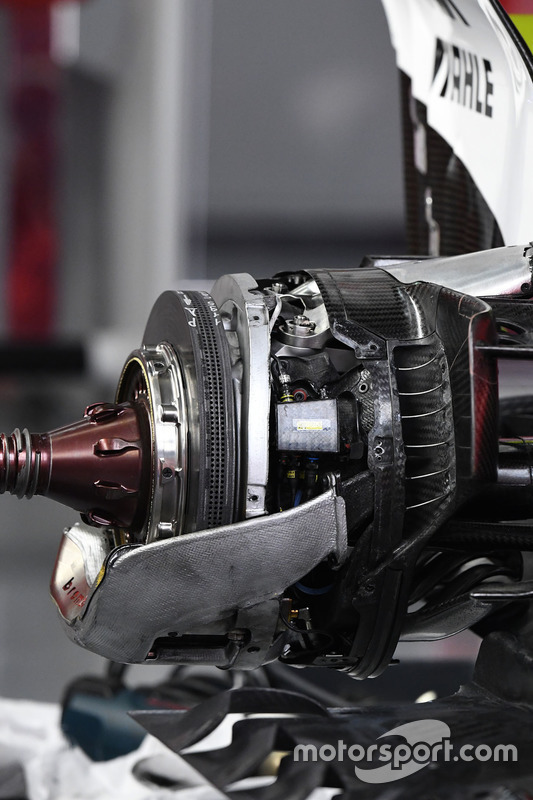 A look at Mercedes’ front brake duct without the drum exposes the detail surrounding the various pathways that the airflow takes to cool the disc, caliper and other ancillary components. The disc still features the scalloped design (red arrow) introduced during 2016 for weight reduction and cooling benefits, while an increase to 32mm discs allowed by the 2017 regulations also allows six drill holes in the disc's face for cooling (inset). 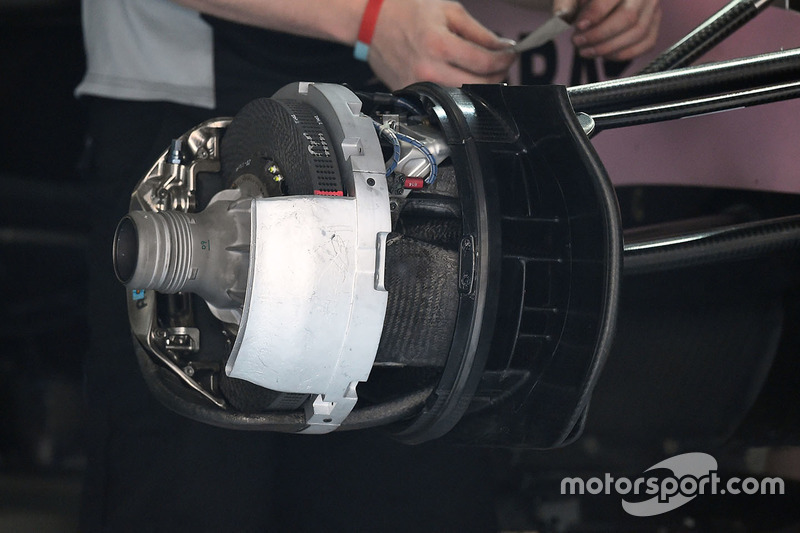 Mercedes has continued with the trend of removing a large section of the chassis to improve packaging of the brake cylinders and suspension. 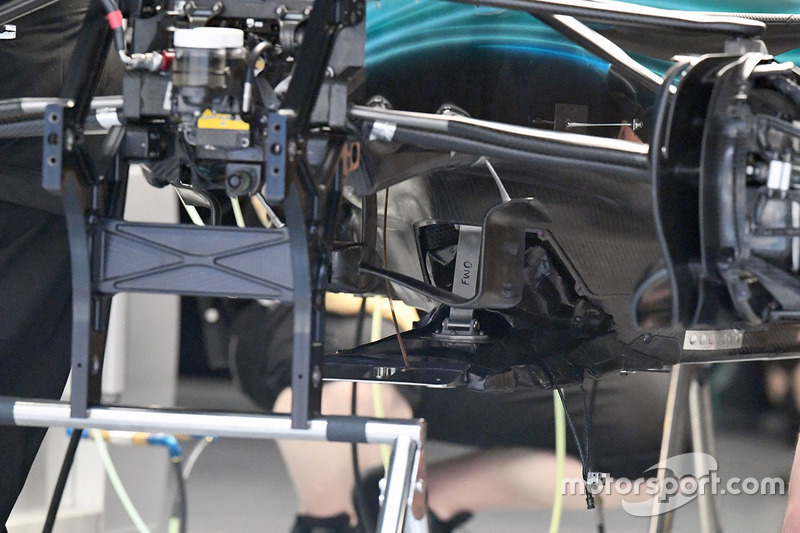 The internal structure of the W08’s splitter is exposed in this shot. 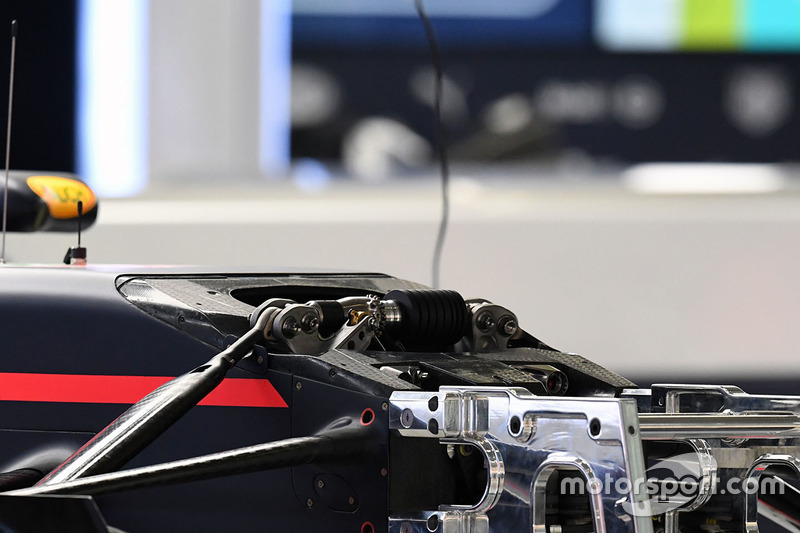 Of note is how the thin metal stay is bent over as the team prepares the car for action. 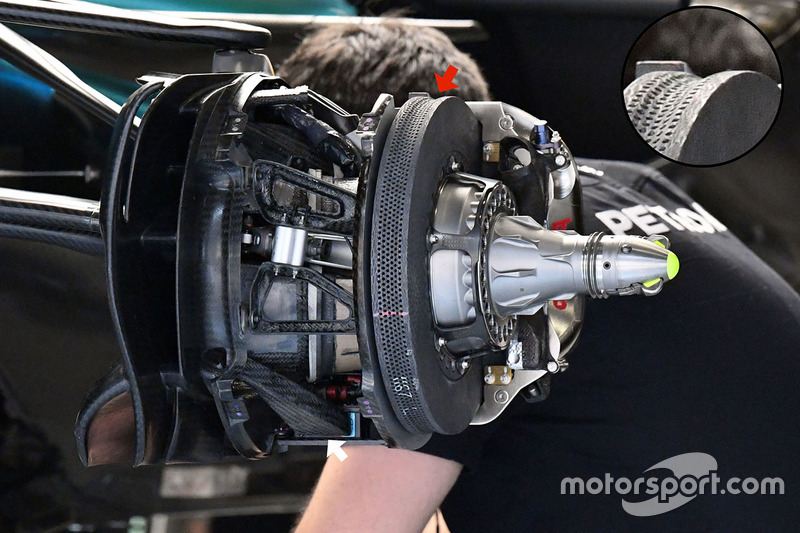 The rear brake assembly on the W08, like the front, features numerous pipes that are used to cool the brakes, be it discs, calipers or other ancillary components. 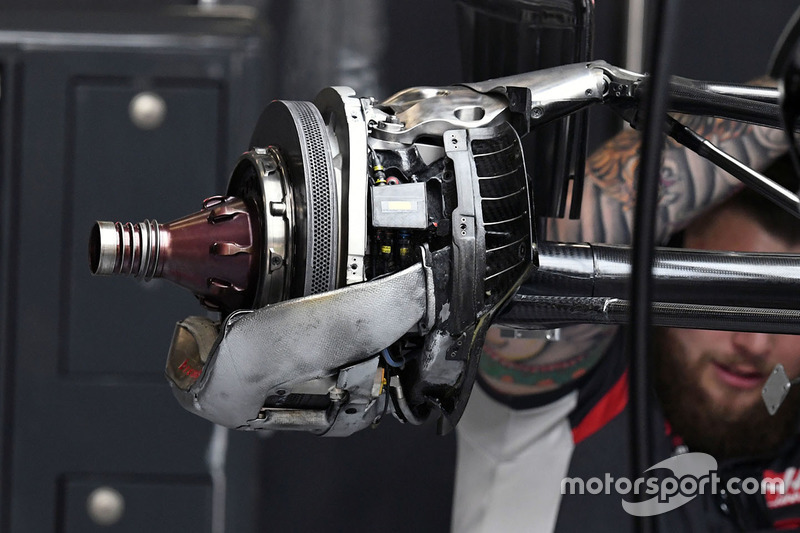 You’ll note that the outer of the two pipes used to cool the caliper features heat paint, as the team is mindful of how heat generated within the brake assembly can be soaked into the wheel rim, affecting tyre temperature and pressures. 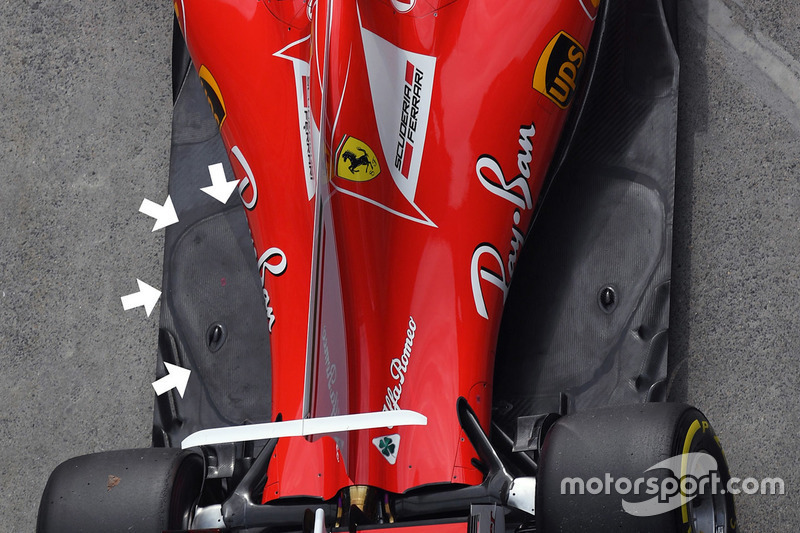 Note the ‘horn’ used to displace the upper wishbone from the upright, while numerous fins are attached the brake duct fence in order to work the airflow and not only improve downforce but also condition the wake shed by the tyre to reduce drag. 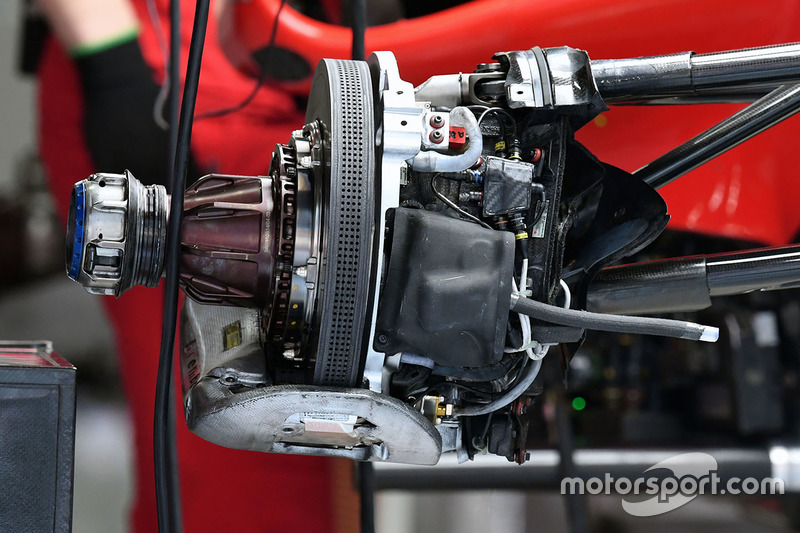 This shot of the SF70H’s front brake assembly shows us that the Scuderia has opted for a brake disc comprising of four drill holes across the disc's face for China. This suggests that temperatures are not a limiting factor, considering there exists an option with up to six smaller drill holes. 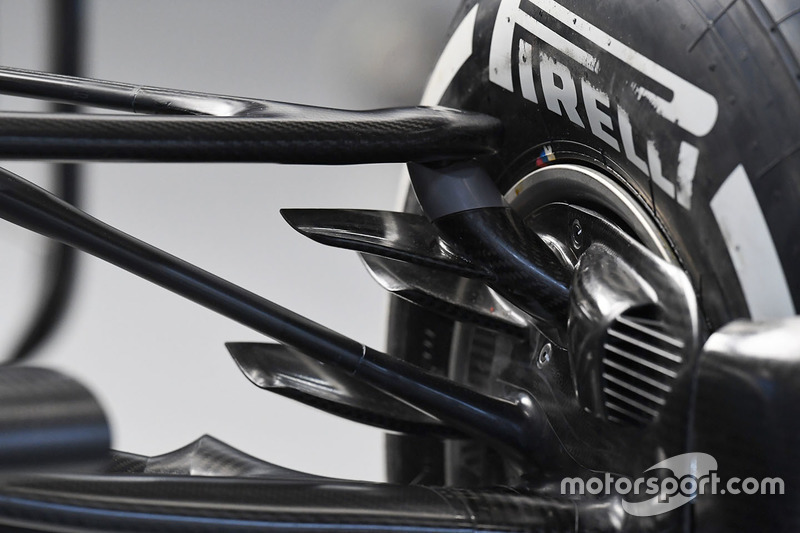 A shot of the brake duct's outer fence shows the level of aerodynamic detail that is present, with numerous fins used to control the airflow's destiny. 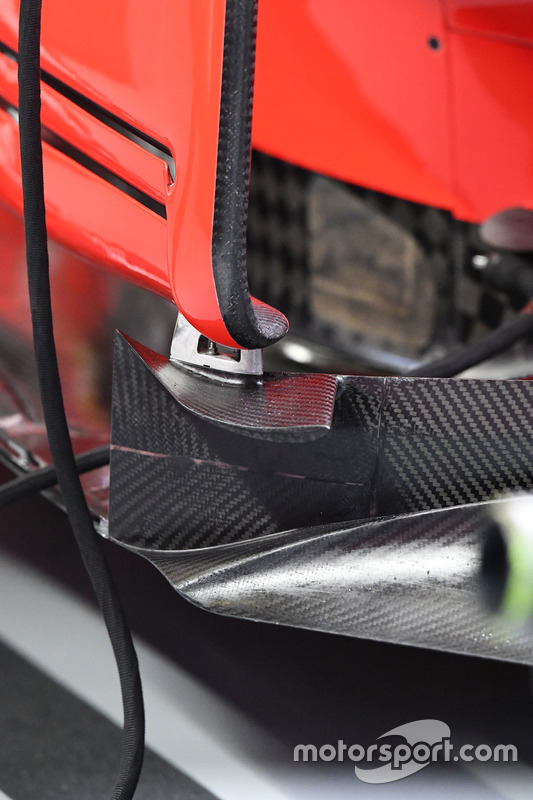 An extreme close-up of the brake duct inlet shows the wire catchment that has been added for 2017, as the Scuderia looks to limit the chances of any debris being collected and impinging on performance. The rear brake discs on the SF70H only feature three drill holes across their face but retain the full 32mm width that is allowed in 2017. The rear inlet features wire catchment, just like at the front, in order to limit the collection of debris while out on track. 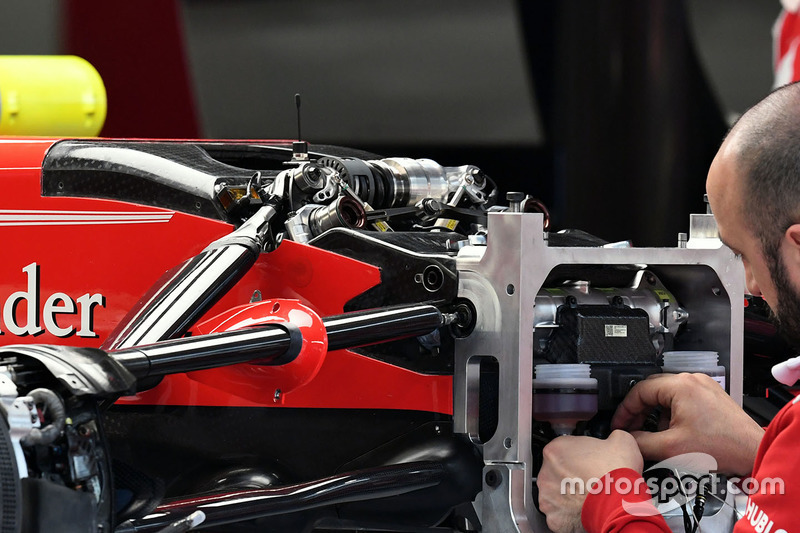 One of Ferrari’s engineers works on the setup at the front of the car as it’s prepared for action. Note the large third heave element located between the rocker arms, which, as is en vogue at the moment, sit high up in the chassis. Detail of the outlet for the ‘S’ duct shows how much thought has gone into making uninterrupted surfaces in order to keep the movement of airflow smooth as it moves downstream. Here's an extreme close-up of the winglet astride the floor's axehead and how it’s connected to the sidepod airflow conditioner above. This is the surround for the radiators housed within the SF70H’s sidepods. 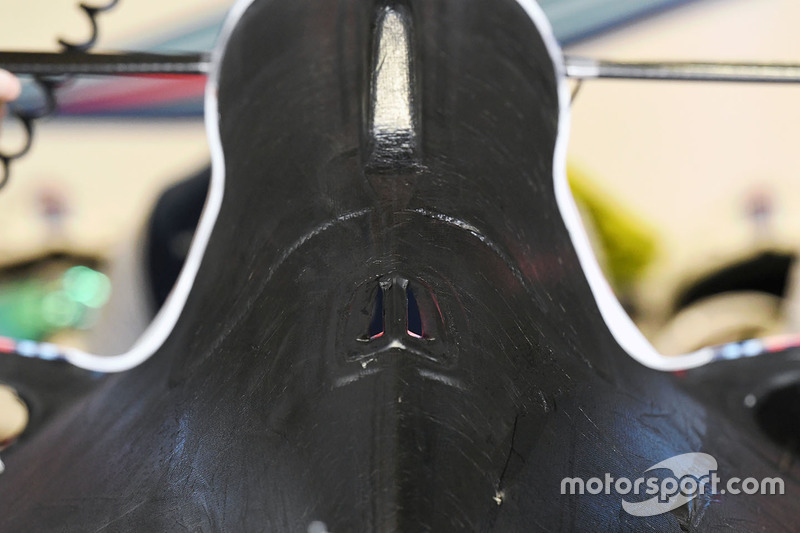 Numerous fins redirect air as it circulates within the sidepod in order to improve efficiency and performance. 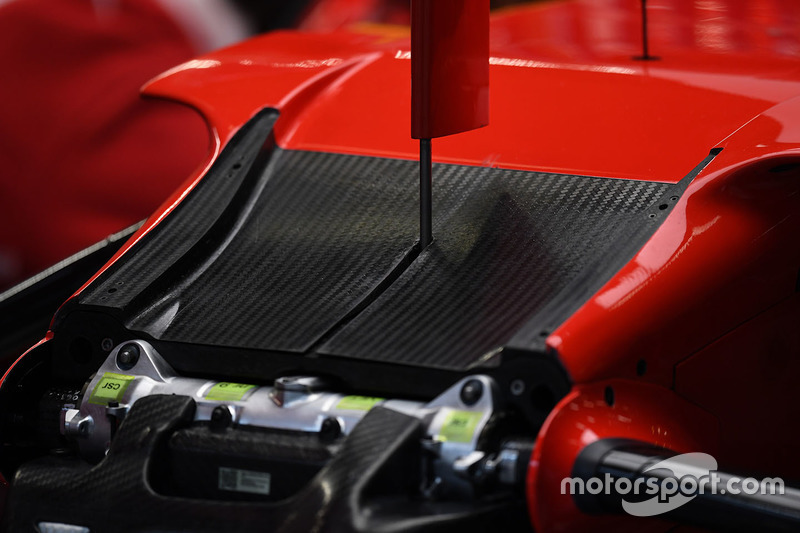 The SF70H’s floor features a raised lip (arrowed), covering the conduit that was present during testing and is thought to house cooling for the oil system. 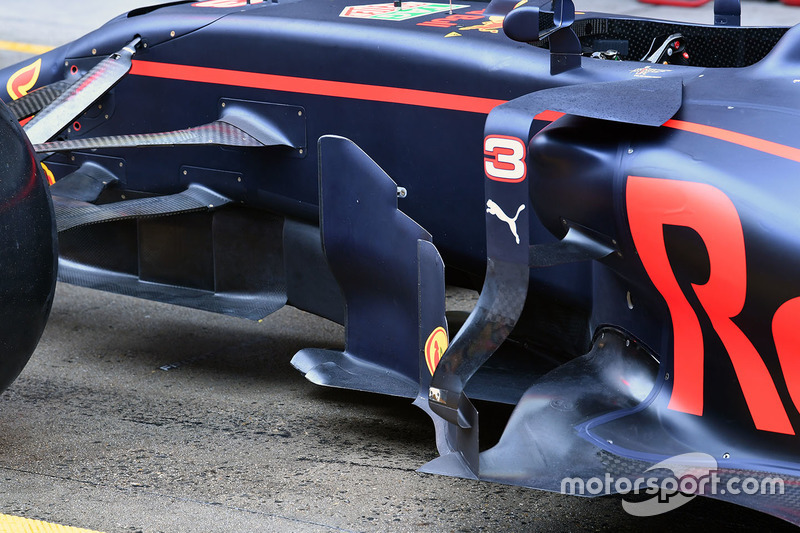 Airflow taken in by the inlets is used to cool the discs, calipers and provide further aerodynamic effects. 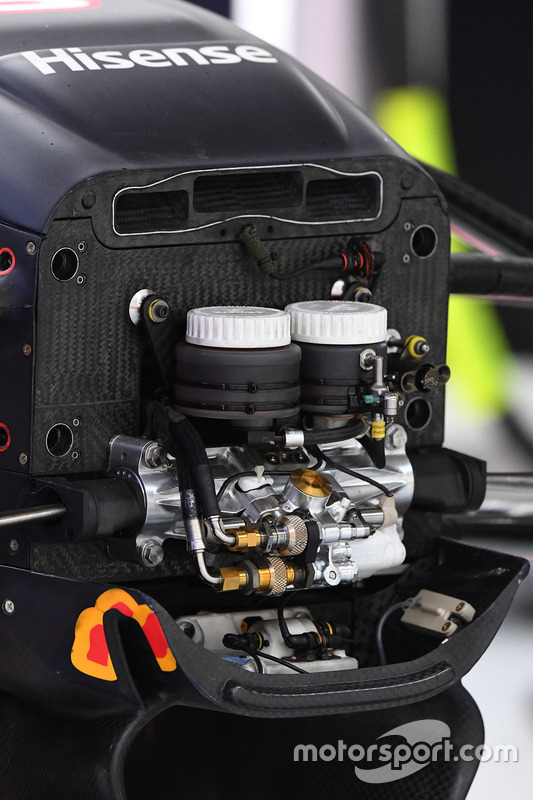 In the case of Red Bull, air drawn in by the main inlet serves numerous purposes, including supply of air to the blown axle and crossover pipework - which ejects air out of the wheel face (arrowed). 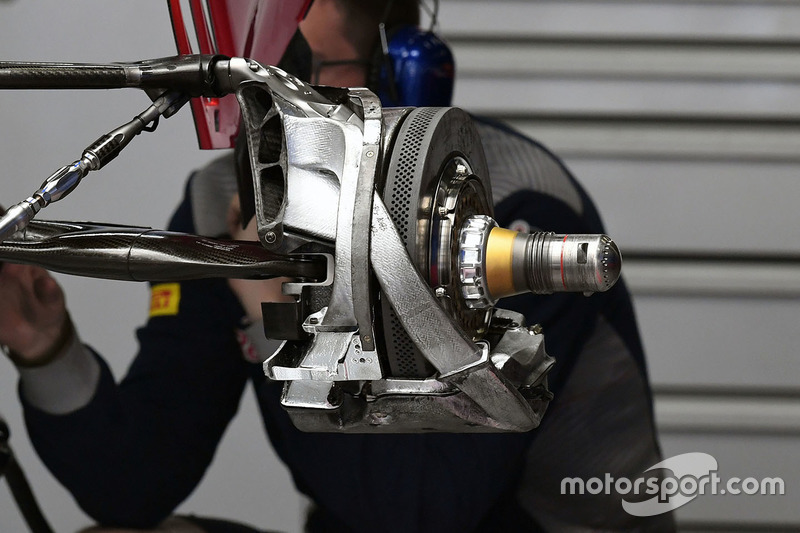 Red Bull places its caliper at the bottom of the arrangement, unlike most of the field, for which a separate duct supplies cooled air to it. 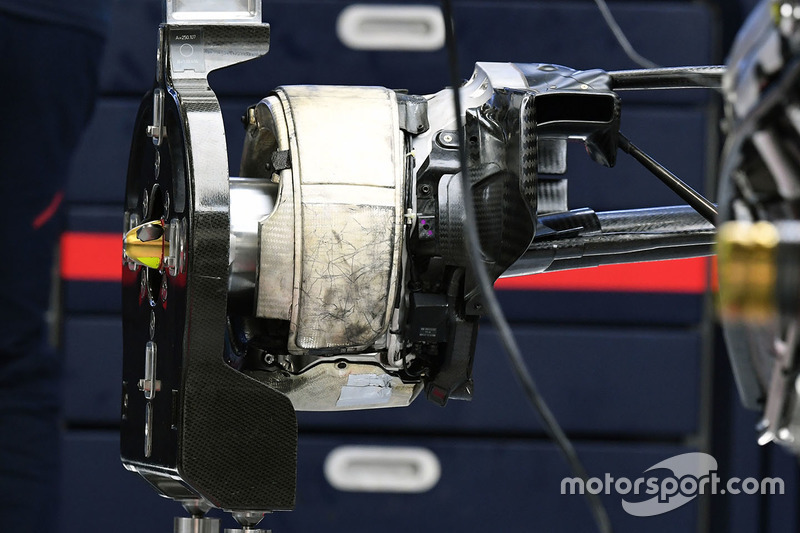 You’ll also note the team uses five larger drill holes to cool the brake discs at the front of the car. 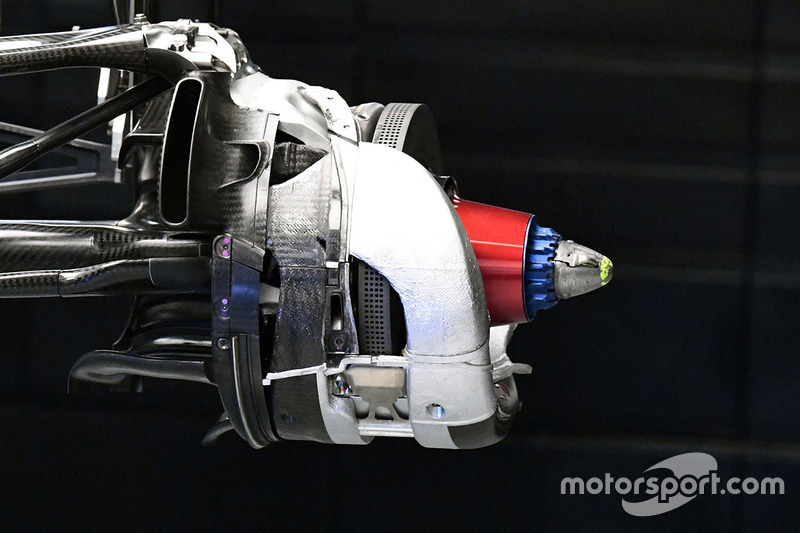 A fantastic shot of the RB13 without the nose shows us how the brake cylinders, steering assembly, driver cooling and ‘S’ duct are all very neatly packaged. 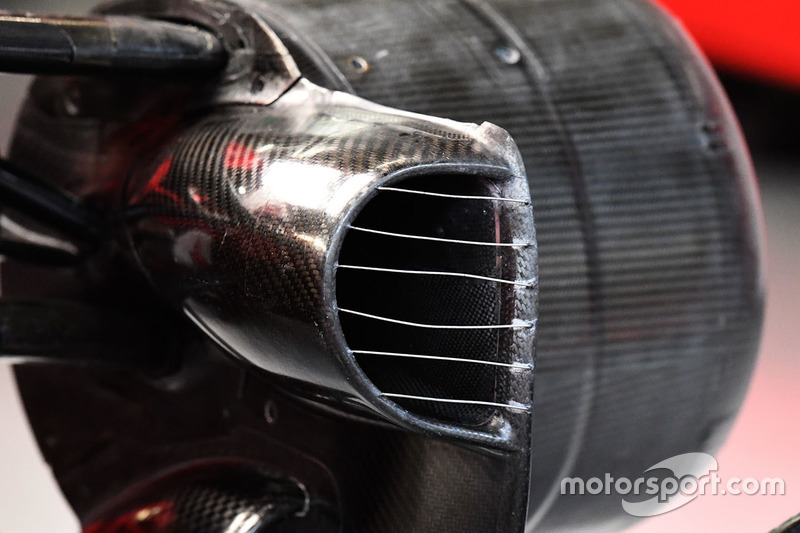 Note the open-ended style endplate louvres, which can now be found on numerous cars up and down the grid. 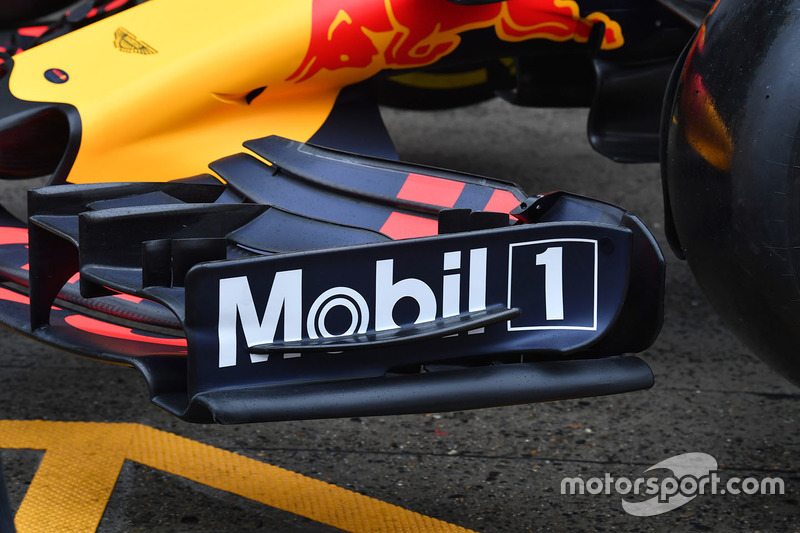 The RB13’s front wing is a little less complex than some of the team's closest competitors - but is elegant nonetheless. 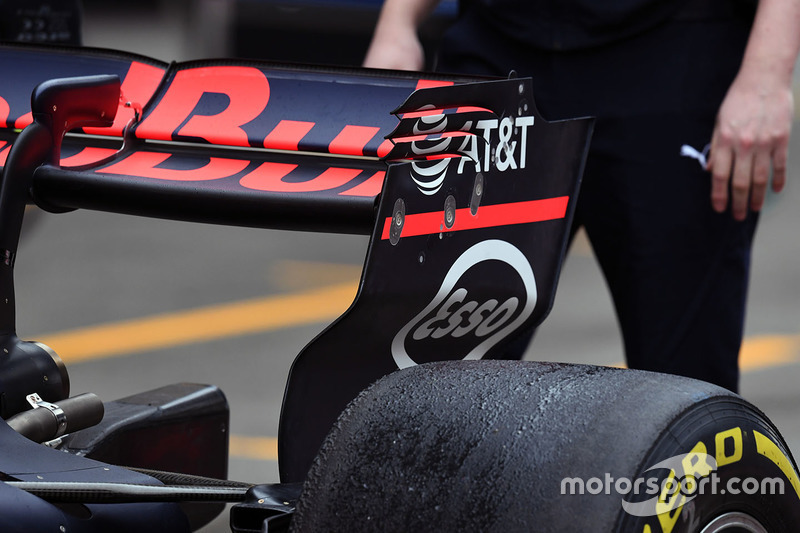 Note how the inner flap tips are upturned, something that we only see featured on the Red Bull thus far. 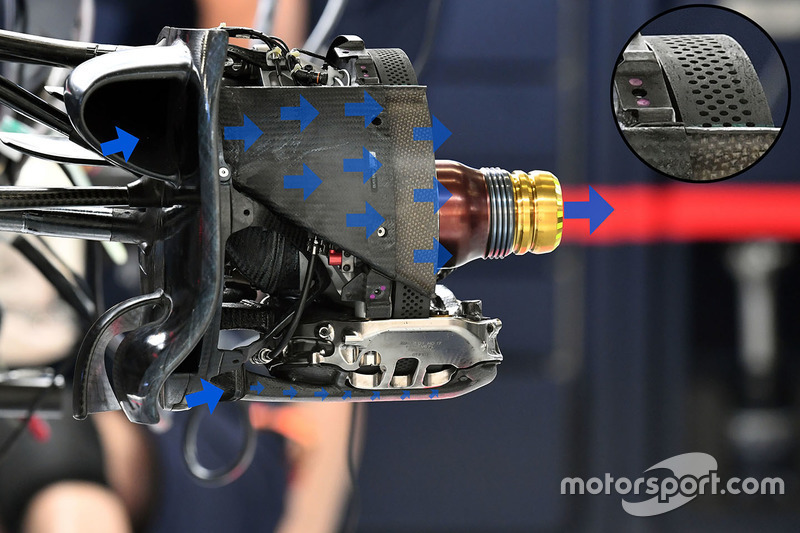 Front suspension packaging has become quite critical over the last few years, and here we can see just how high Red Bull has opted to package its rocker arms. Note also that the team is using belleville springs as part of the heave element, something it's been doing for a number of years now. A detailed shot of the 'S'-duct's outlet. This shot of the RB13's turning vanes and bargeboards displays the elegant complexity of the area, especially if compared to some of the team's rivals. 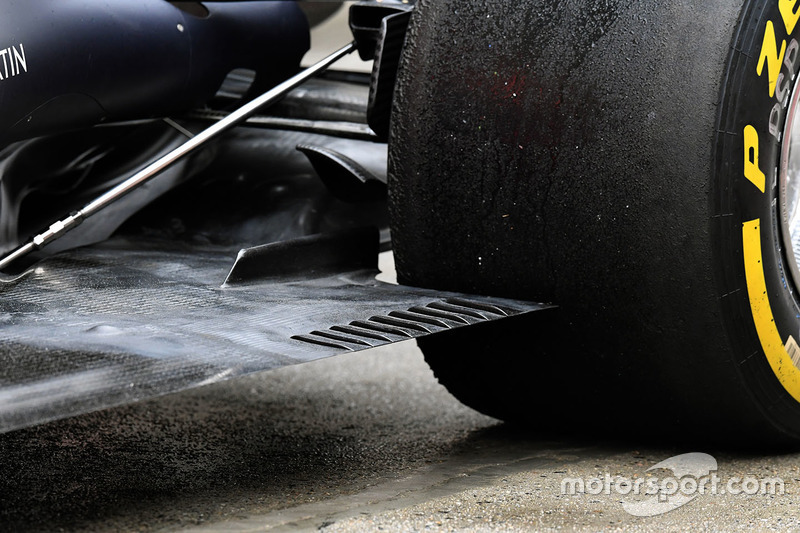 A look at the slots used in the floor ahead of the rear tyre used to combat the effects of tyre squirt - when the deformation of the tyre disturbs the diffuser. 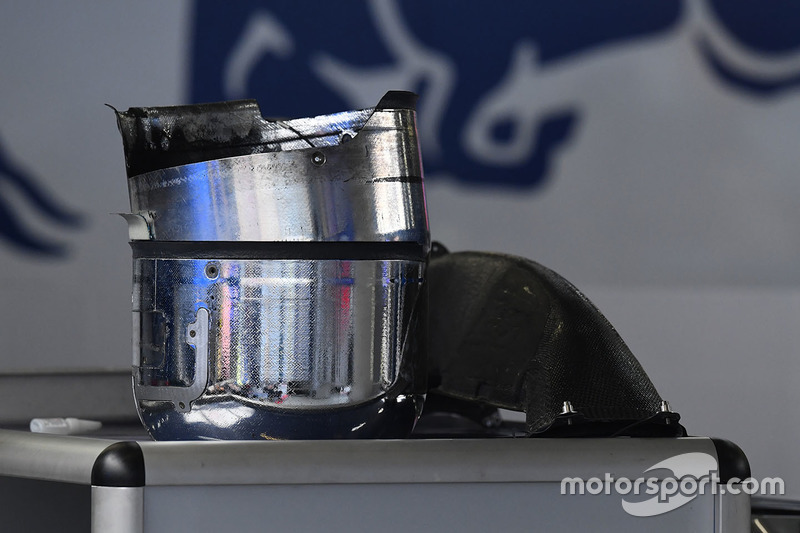 The pipework used to cool the rear brake components has been treated with heat paint on the RB13. This is to control how the heat being generated interacts with the wheel rim and, in doing so, changes the behaviour of the tyre. 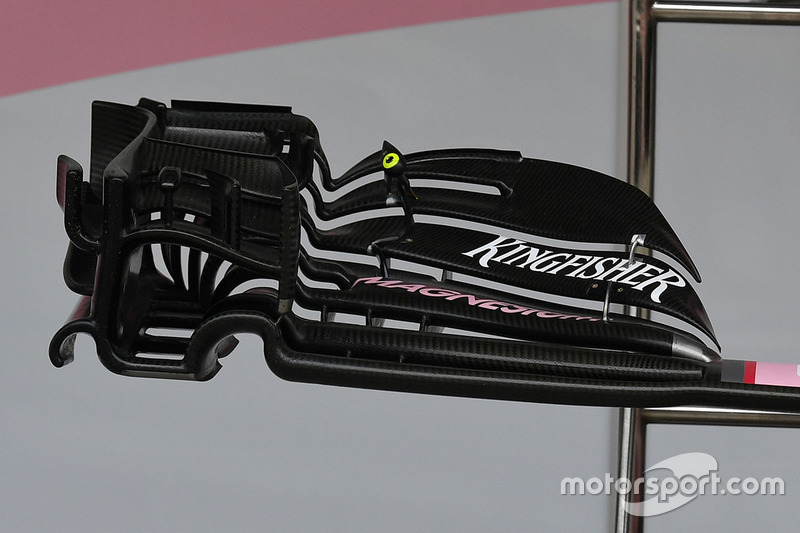 Force India has revised its front wing layout for 2017, although from a philosophy point of view it is very similar to the one introduced last season. 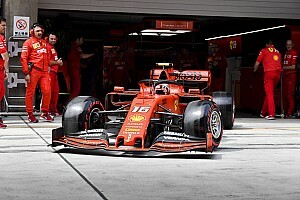 The main change is to the flaps, with a distinctive V-shape now present as the outer flapped section meets with the outer area that’s designated to deal with shaping the airflow that hits the front tyre. 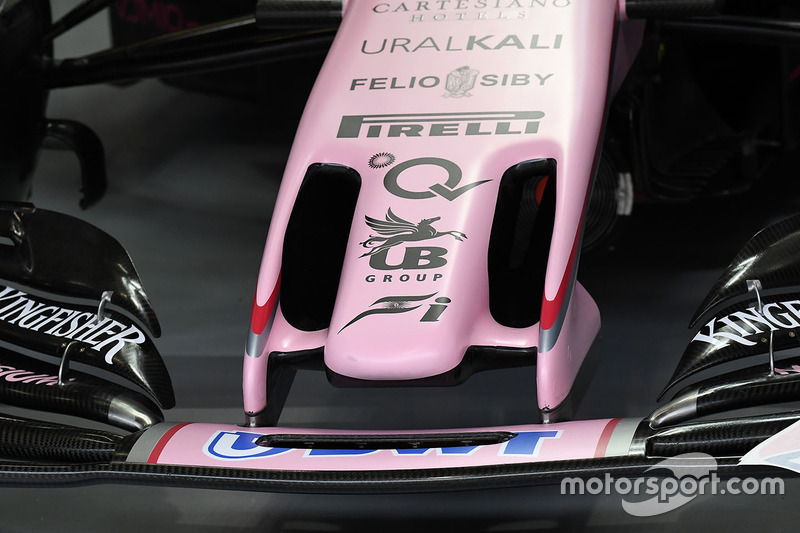 Force India’s 2017 nose design is a more aggressive version of the ‘cobra’ solution it has been running for the last two seasons. It allows more air to pass either side of the central thumb style protrusion. 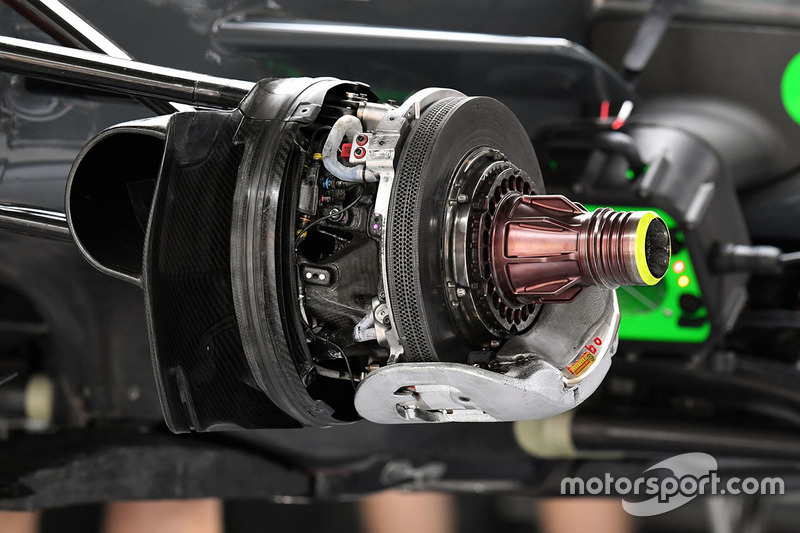 A look at the VJM10’s front brake assembly without the drum fitted exposes numerous details on how airflow is used to both cool the brake components and improve airflow around the front wheel, with the team utilising both a crossover pipe and blown axle. 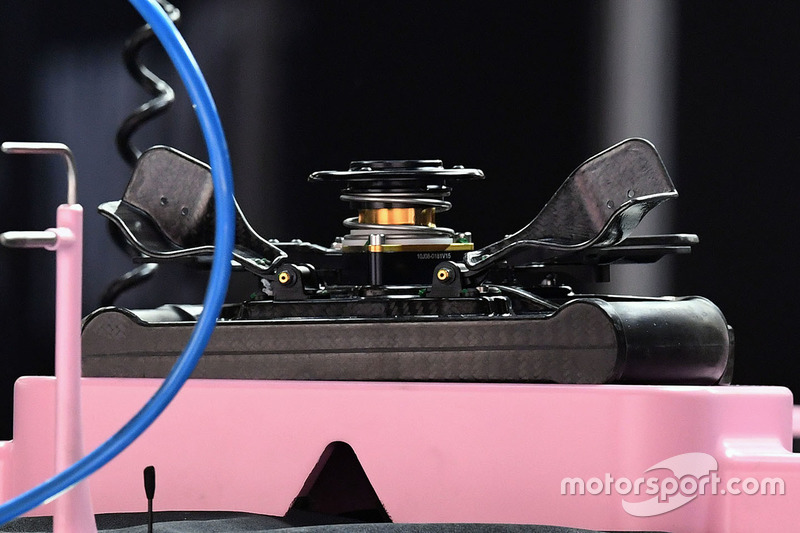 The clutch paddles on the VJM10’s steering wheel have been modified for 2017 in order to give the driver a reference point with which to work from. 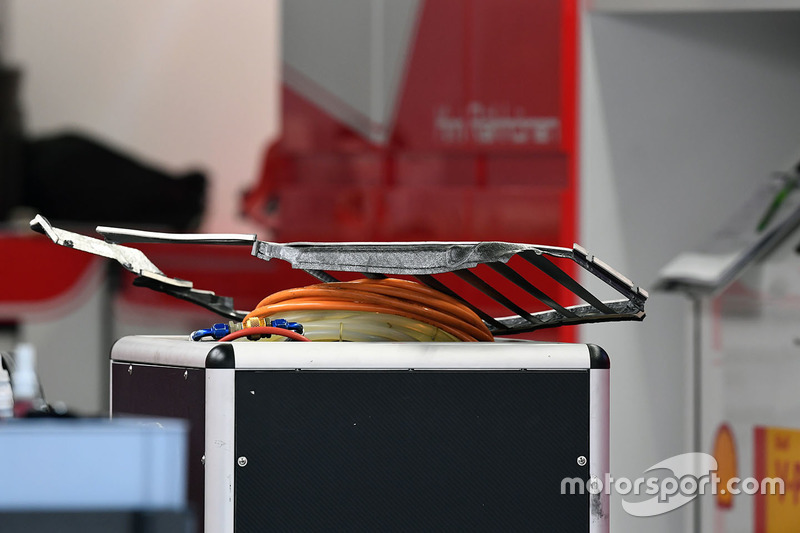 The shape of the paddles will give the drivers more feel as they look to engage the clutch at the start of the race or when leaving their pit box. 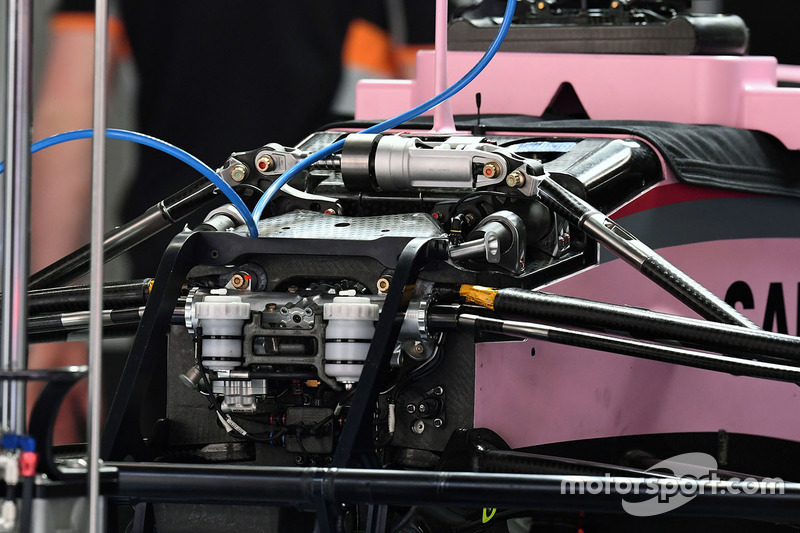 Force India has followed the lead of teams such as Mercedes, Red Bull and Ferrari in cutting away a large portion of the chassis to enable better packaging of the suspension. You’ll note the large ‘heave’ element that now occupies the space between the suspension rockers that wouldn’t be possible without the section cut away. 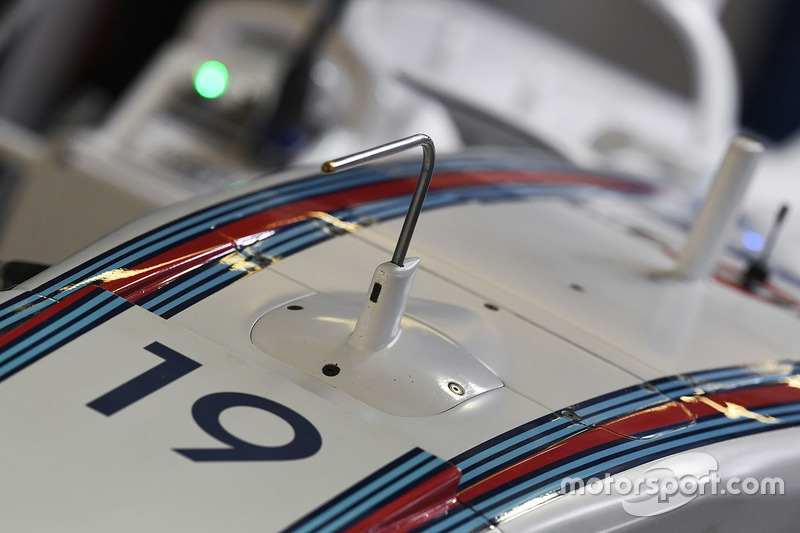 With Williams using an 'S' duct in 2017, here is a shot of the exit and the aerodynamically-designed bodywork that surrounds the pitot tube behind. This inside shot of the the FW40’s engine cover reveals the cooling apertures that reside either side of the shark fins spine. 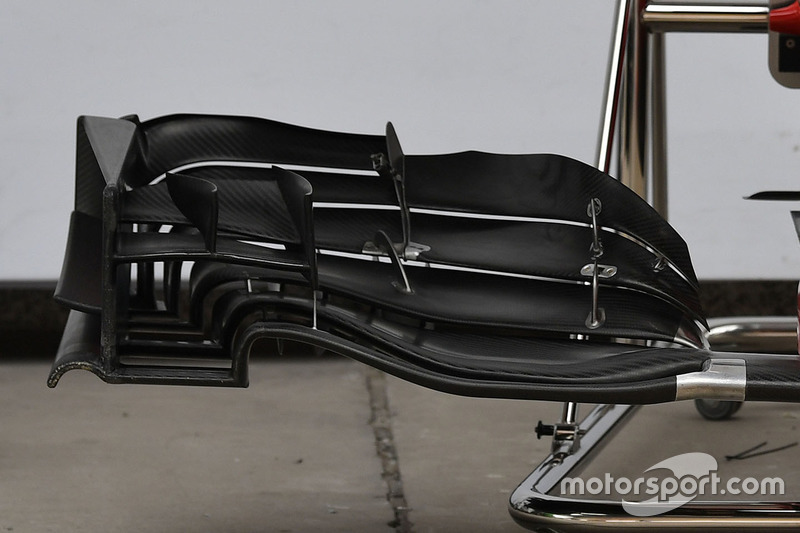 McLaren’s new T-Wing combines designs already seen from Mercedes and Williams. 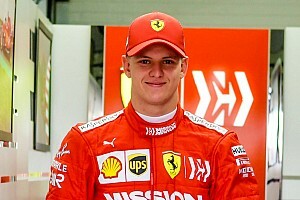 The upper element is contributing to the overall downforce of the car, while the lower section is more for support and limiting the overall effect the winglet has on the rear wing. 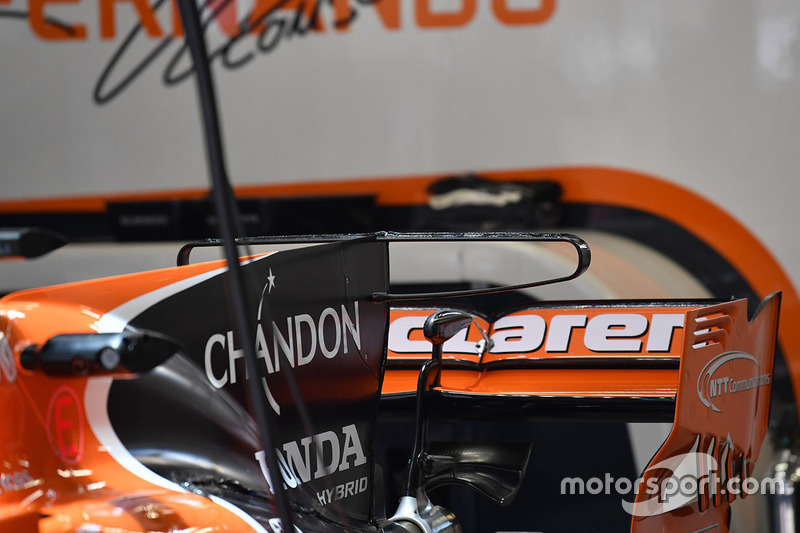 Another look at the MCL32 rear wing and T-wing. 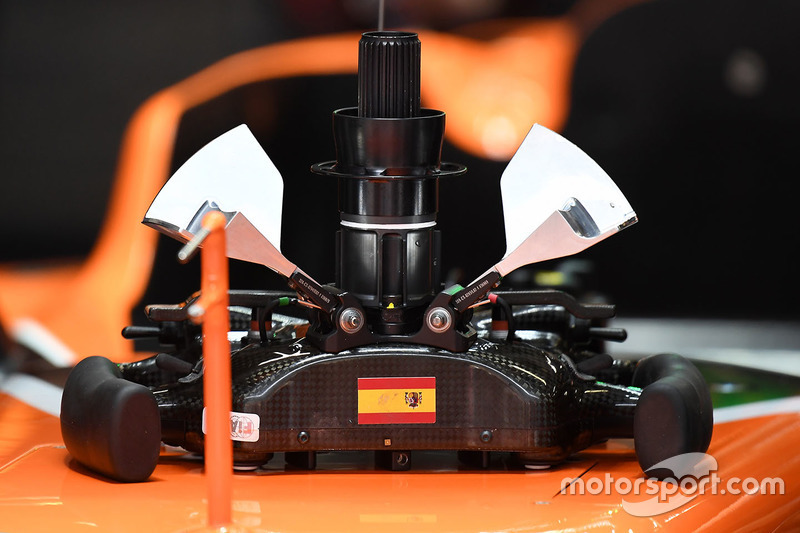 This is the steering wheel employed by Fernando Alonso and Stoffel Vandoorne. Note ote the level of detail that has gone into the clutch paddles in order to give the drivers the feel required to get a good start on the grid. 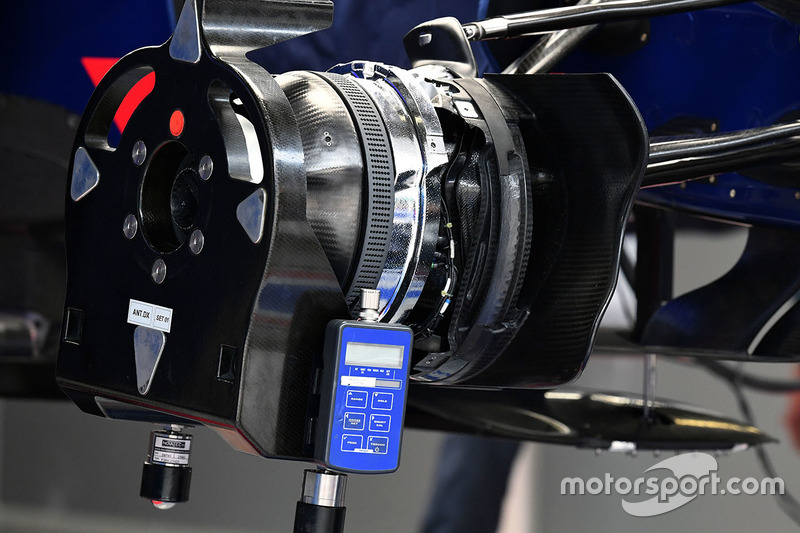 Toro Rosso is employing six drill holes across the face of the front disc in order to dissipate heat being generated under braking. The holes are inline though, whereas others that run six holes tend to run them in a chevron pattern. 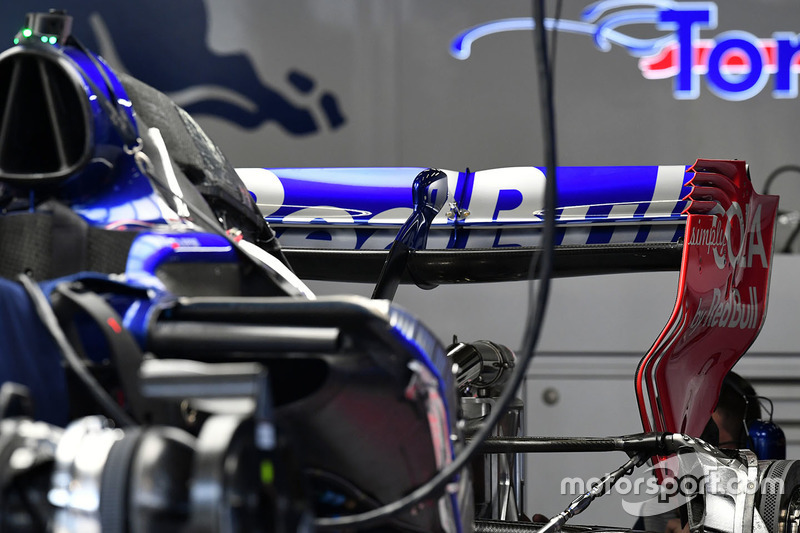 Pipework complexity at the rear of the car tends to be a Toro Rosso trait, one that seemingly yields good performance and efficiency. 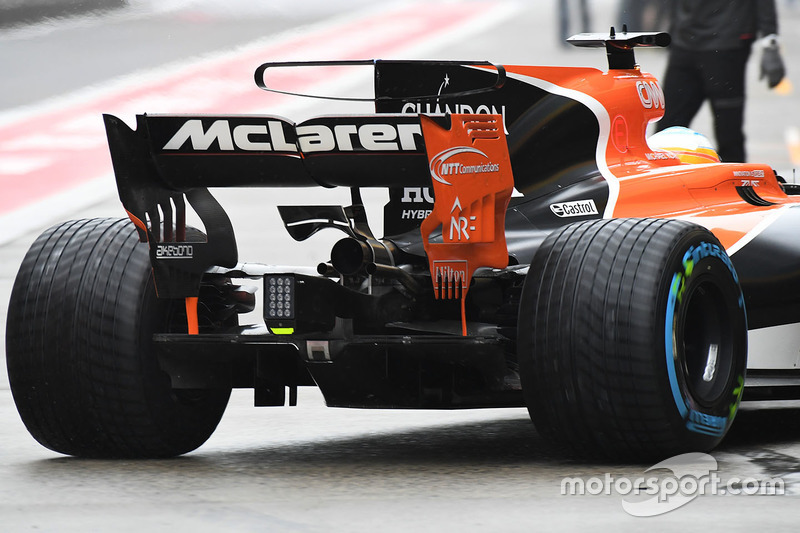 You’ll note that the team has opted for five enlarged drill holes in a chevron pattern in their discs for China. These are the brake drums - or ‘cake tins’ as they’re normally known to the teams. Here they’re covered in a heat reflective surface in order to help with heat transfer between the brakes and wheel rims. 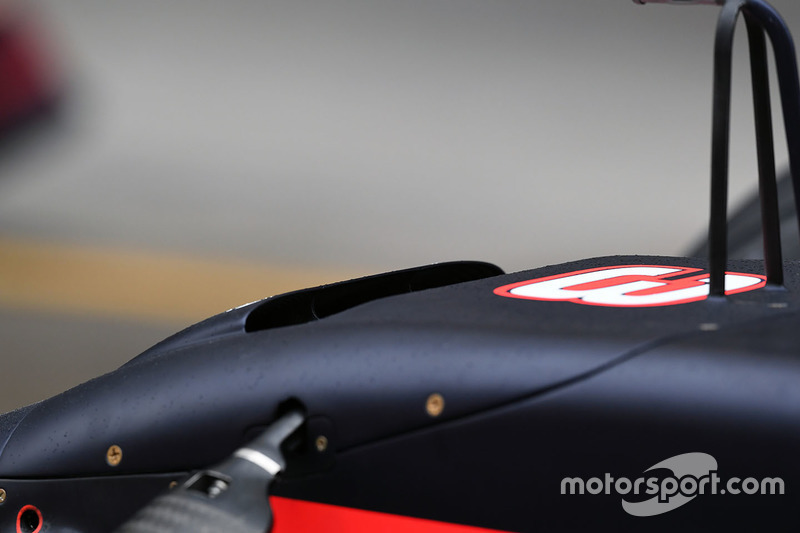 In China, STR used a gentle spoon-shaped rear wing for a trade-off of downforce and drag. The VF17’s front wing was subject to several modifications in Australia, among them a more curvaceous mainplane and elongated endplate canard. 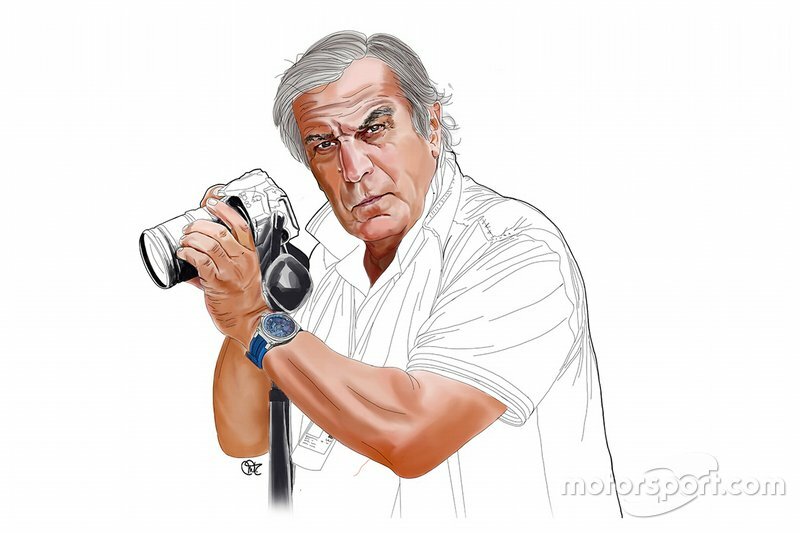 There is a certain commonality with Haas components and Ferrari, owing to their supply deal. 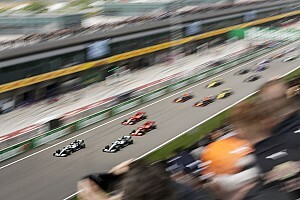 But it is worth noting that the American team will make different set-up choices from circuit to circuit. 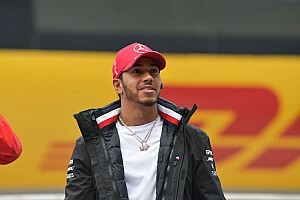 In China, Haas used a six drill hole disc in a chevron pattern, the maximum cooling package available to the teams from their supplier. 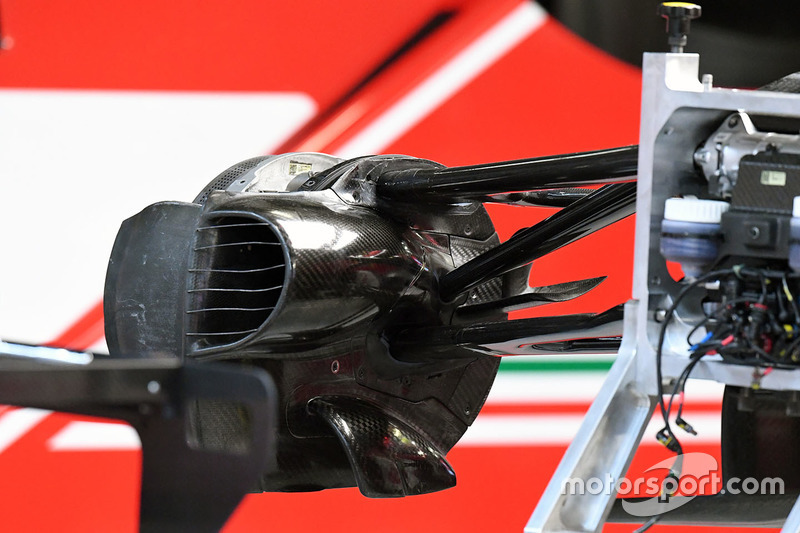 At the rear of the car, the VF17 is utilising a similar debris defence system as Ferrari, with numerous horizontal wires strewn across the inlet, while the team has opted to use a five drill hole disc configuration. 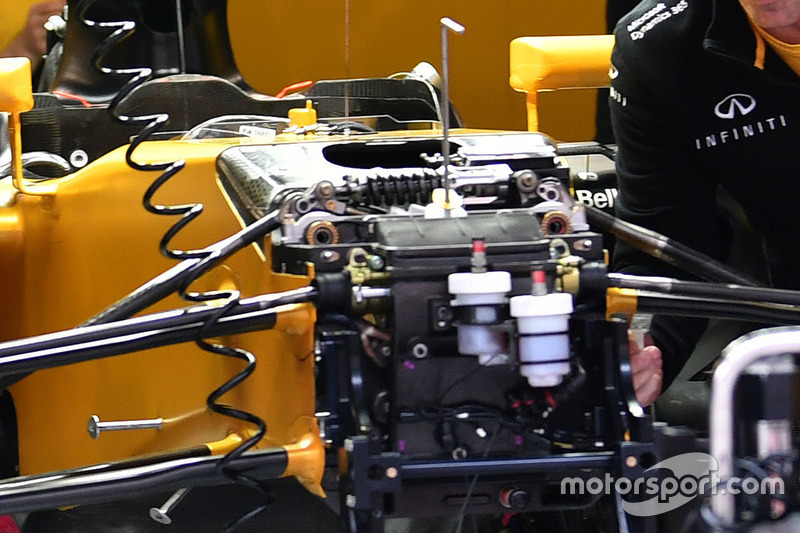 This shot without the nose on the RS17 shows the packaging of the suspension, which has been revised for 2017 inline with what some of the lead teams have been doing. 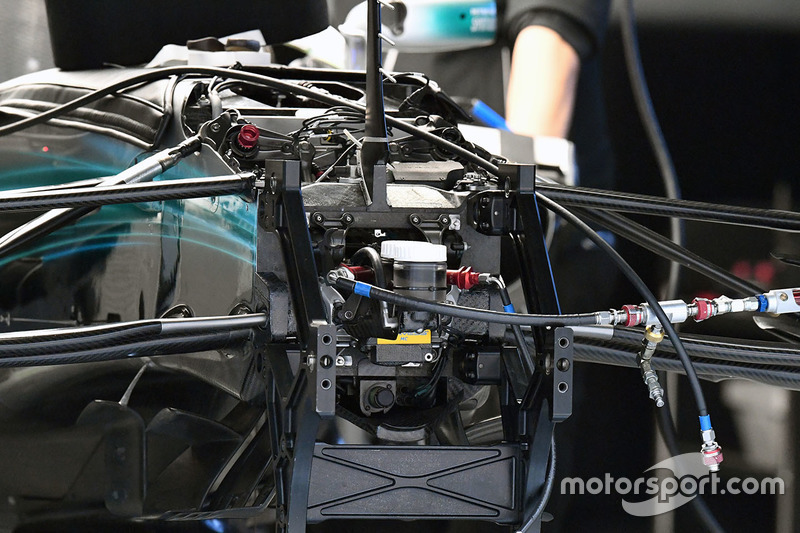 Note the high position of the suspension rockers and the ‘heave’ element mounted between them. 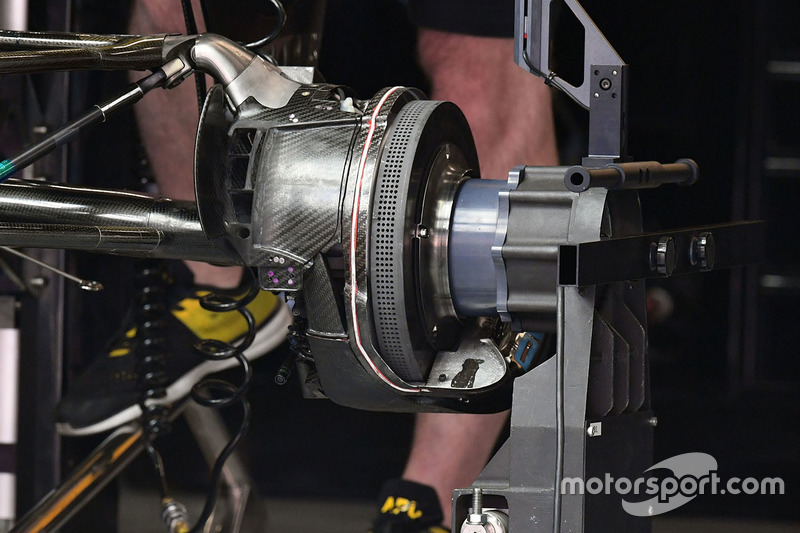 Renault has opted for a larger four drill hole arrangement in its rear brake, looking to dissipate the heat generated under braking.